Our summer vacation was 10 days long, and we went to so many places and did so many things, it’s taking me a long time to write all about it! We started at the South Rim of the Grand Canyon, then drove around the canyon to the North Rim. One of the first things we noticed when arriving at the North Rim was that it was quieter than the South Rim. There were quite a few tourists there, but it definitely wasn’t as crowded. One of the first things we did was pick up the Junior Ranger books for the girls. They wanted to go find a bug to watch for a minute, which was one of their Ranger activities. 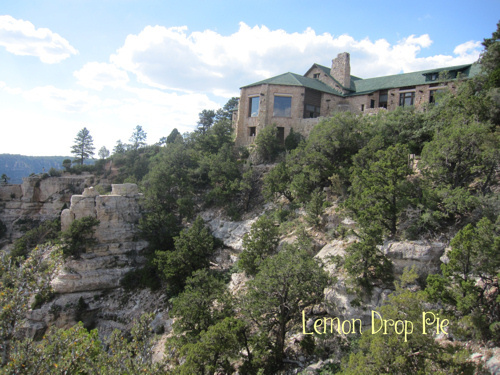 We went out by the lodge and listened to the sounds in the Ponderosa forest at the edge of the Grand Canyon. Lily started following a grasshopper, and it made such a loud whirring sound compared to Midwestern grasshoppers. Emmy tried to observe a fly, but it was not cooperative at all! We wandered down the point out into the canyon; it was a narrow strip of blacktop that extended past the lodge while the edge dropped off into nothing. Scary but gorgeous. The lodge has two large porches with a lot of chairs and benches, and a huge fireplace. It’s cool up on the North Rim since it has an elevation of about 8000 feet. We spent a lot of time at the lodge sitting out on the porch, looking at the canyon, listening to a ranger program, and gazing at the stars. Did you know that it never gets dark in Chicago? It looks dark outside when the sun sets, but there’s always a glow in the sky that makes it difficult to see the stars. Grand Canyon National Park, on the other hand, is one of the best places to go star gazing. We let the girls stay up to look at the stars. Not only did we spot the Big Dipper, but we could also see the Milky Way and how we teeter on the edge of an unfathomable expanse of stars swirling away from us. It was such an amazing sight to see. I haven’t even told you about my favorite place yet. I’ll tell you about it tomorrow. Don’t forget to write about your summer vacation, and link up for the Spin Cycle! Your link will show up both here and on Gretchen’s blog, Second Blooming! The Grand Canyon is on my list of things I hope to see someday. It looks beautiful! Thanks for co-hosting the link up. Thank you so much for joining us this week! So happy that you and your family had this experience. The girls will remember for a lifetime! Thanks, Janice! I think they will remember it! I love looking at the stars. My parents used to have a sailboat so our vacation would be on the boat on the Sacramento delta. The stars were amazing. Every night we’d see shooting stars and satellites. It’s been awhile. Your vacation sounds awesome. My kids haven’t see the Grand Canyon yet. It’s a bit farther now that we are on the east coast! This was the first time I saw the Grand Canyon! It was really amazing! I can’t wait to hear more! Did you see any shooting stars? No, we didn’t, but if we had stayed up later there was supposed to be a meteor shower around midnight when we were there. We were too tired from all our hiking to stay up that late! It never gets dark here in LA either. There’s always a glow. I’m dying to take Jude to the Grand Canyon. I have, however, a love hate relationship with the place – my fear of heights kicks in and freaks me out, yet it’s so beautiful, I can’t stop looking! I know exactly what you mean! I’m right there with you! We have had short trips to the south rim twice now. I really want to go to the north rim. We would probably enjoy it far more–fewer people. The North Rim is so beautiful! It’s very different from the South Rim. I think you would really enjoy it!